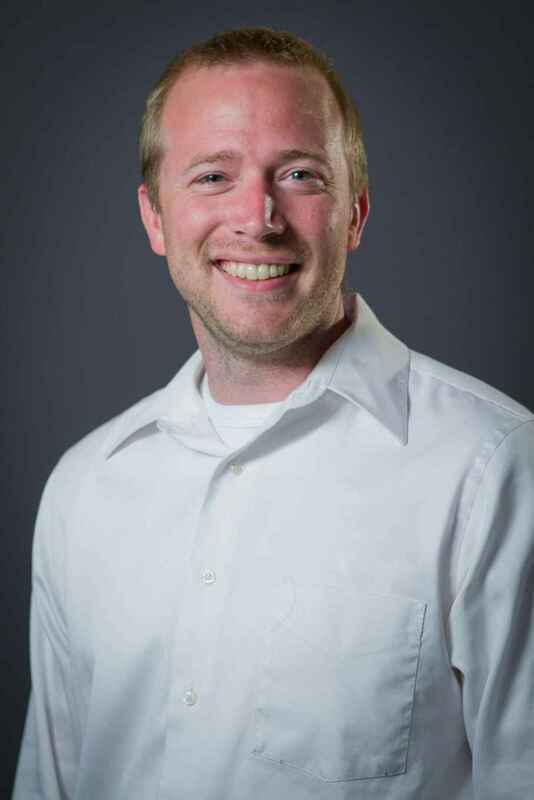 John Welkner – Assistant Pastor, UCCD. Since I published this post I have been in contact with John Welkner via Twitter. It is the first communication of any kind I have had with him since I quit UCCD in March of 2013. Welkner told me he had no contact with Cruciform Press regarding the changing of their reason #6. I believe him. He asked me if I would change my story to reflect that fact and I said I would. Remember a few years ago when the gospelly boys at Together For the Gospel (T4G) finally broke their silence on the sexual abuse scandal plaguing the Sovereign Grace Churches denomination; the denomination headed by their good friend C.J. Mahaney? If you need a quick refresher check out this blog post at the Spiritual Sounding Board. Basically, Al Mohler, Mark Dever and Ligon Duncan produced a statement in support of C.J. 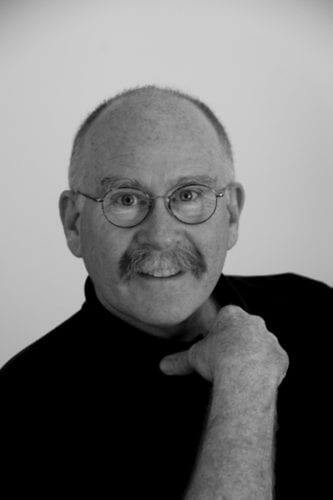 Mahaney. The statement was untruthful, misleading and proved to be an embarrassment. They published the statement on the T4G Facebook page and immediately began receiving negative comments. 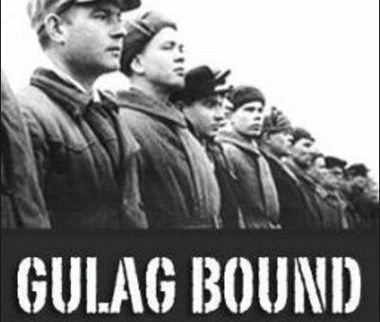 The comments swelled to such a large number that our brave boys decided their best course of action was to remove the comment from Facebook, alter the original comment – hoping nobody noticed and then republish the revised version on the T4G website where no comments were allowed. Well, a similar stunt has just been pulled with a promotional publication for a Bible study book authored by Keri Folmar, wife of John Folmar, Senior Pastor at United Christian Church of Dubai (UCCD). John Folmar was once an assistant pastor at Capitol Hill Baptist Church. 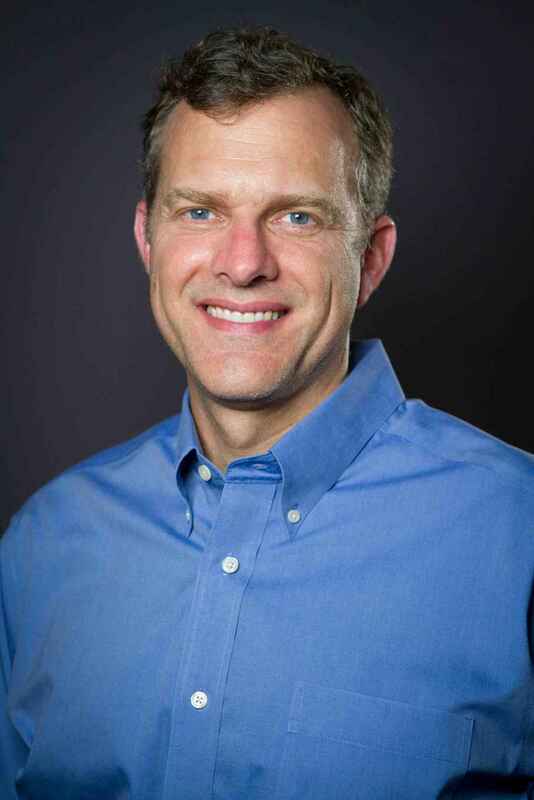 Folmar sat under the tutelage of Senior Pastor Mark Dever and it appears he learned much from him including heavy-handed authoritarianism, abuse of church discipline and the necessity of installing a membership contract to control the pew-sitters. It would appear Folmar may still be learning from the master. Looking back on my time as a member in UCCD there were two topics that were strongly emphasized. The first was church membership. You can listen to almost any sermon of Folmar’s and at some point he will give a strong sales pitch on the importance of becoming a member of UCCD. I believe church membership actually receives more emphasis than the Gospel message. The second was male headship. Women were not allowed to teach men, not selected to read Scripture in the morning worship service, not allowed to participate in the distribution of the elements of the Lord’s Supper and of course not allowed to serve as an elder. UCCD is strongly in the complementarian camp and opposes egalitarianism. If you search the 9Marks website you will find that Folmar’s church is listed as an approved 9Marks church. 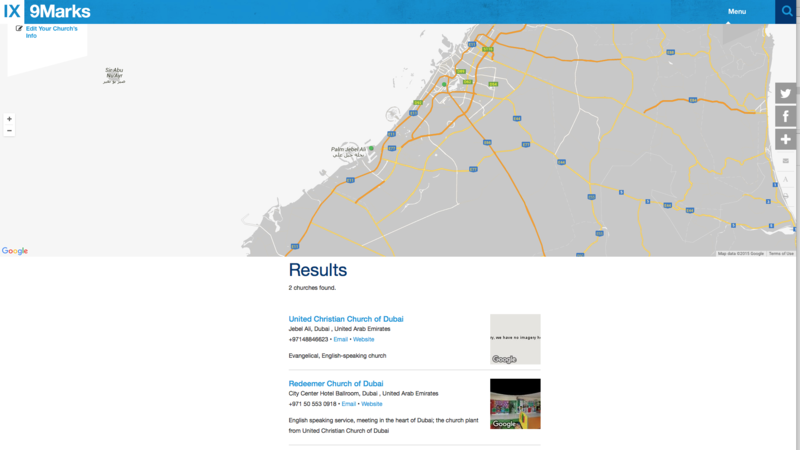 What does a church need to do to be listed as an approved 9Marks church? The “T4G Affirmations and Denials” is quite a lengthy document, but the Article of interest is below. UCCD would strongly support this article. So now we get to the intent of this article. 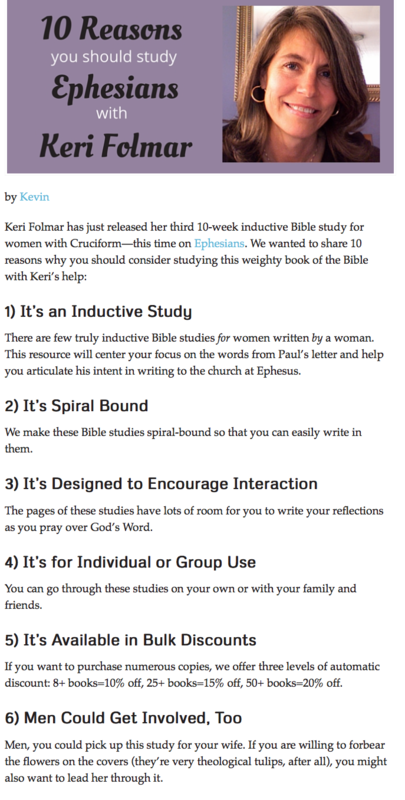 Yesterday I came across a Tweet from UCCD with a link to a promotion of a Bible study book on Ephesians authored by Keri Folmar, wife of Senior Pastor John Folmar. Below is a screen capture of the promotional page. As the title says, there were 10 reasons listed, but my screen capture could only fit the first six in, and I was only interested in number 6. Read it carefully. It’s not Just for Women! Say what? So UCCD, on their Twitter account is utilizing a promotion which states that men can be taught by Keri Folmar? This is about as close to heretical as you can get. 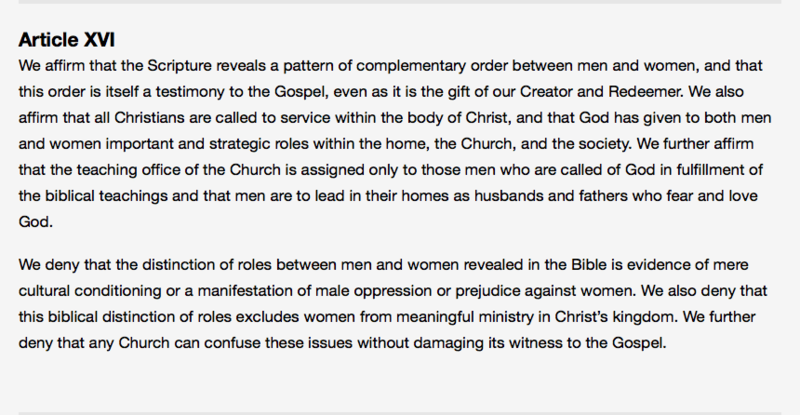 Complementarianism is a non-negotiable in 9Marks churches, in fact, if you read Article 16 above closely you will see that messing with this sacred doctrine damages a church’s witness to the Gospel. 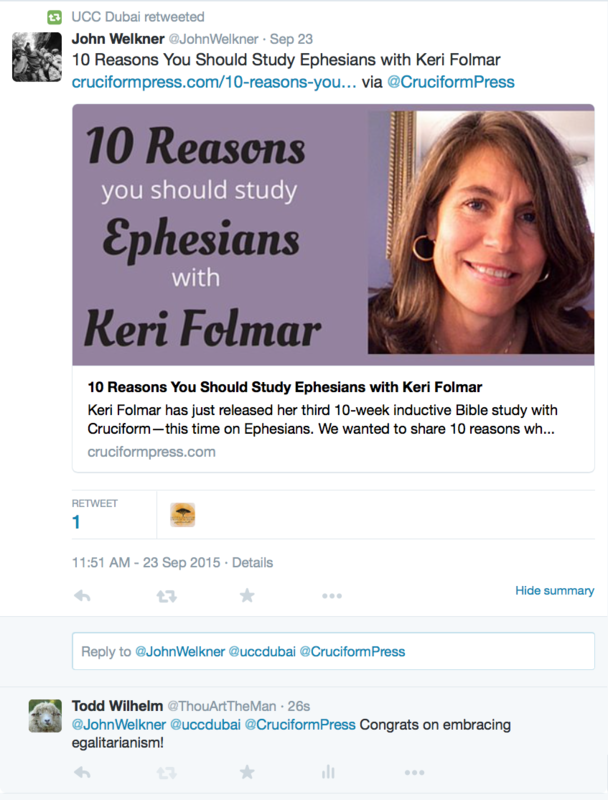 I quit UCCD because of Folmar’s refusal to stop promoting C.J. Mahaney’s books, but now I see the hand of Providence at work. Promoting a guys book who conspires to cover up the sexual abuse of children and blackmails the co-founder of his ministry is small beans. God got me out of a church just over 2 years ago that has damaged its Gospel witness by allowing a female to teach a male. I have much to be thankful for! Well, of course, I say all that with tongue in cheek, but I couldn’t help utilizing social media to rub UCCD’s nose in their hypocrisy. Below is what I tweeted to them. Whew! Crises averted, order restored, all is once again well in the 9Marx world of churches. 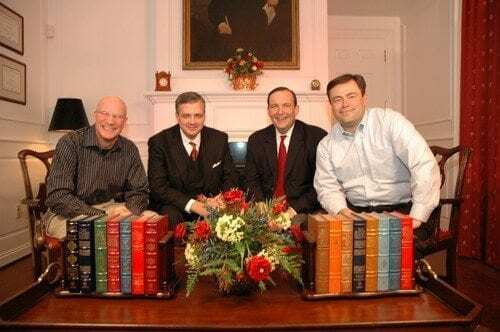 John Folmar will remain in the good graces of Mark Dever. That was too close for comfort. Did we say men can use this study? Pay no attention to the man behind the curtain, we really meant you gospelly strong men can only purchase the book for your wife and then lead her through it. But please don’t take any of Keri’s teaching to heart as you lead your weaker vessel through the study of Ephesians. That would be against corporate policy and could result in excommunication – which is just another word for loving discipline. OK John and John, my two favorite men of integrity, that is all I have for you today; you can get back to studying your second most important book to see who is next in line for disciplinary action. Here is a post I wrote after I found out John Folmar “allowed” me to quit his church. The “his” is intentional. There were some great observations I included from a guy named Eric. Eric expressed views from his experience in Mahaney’s Covenant Life Church that resonated with my experience in United Christian Church of Dubai. 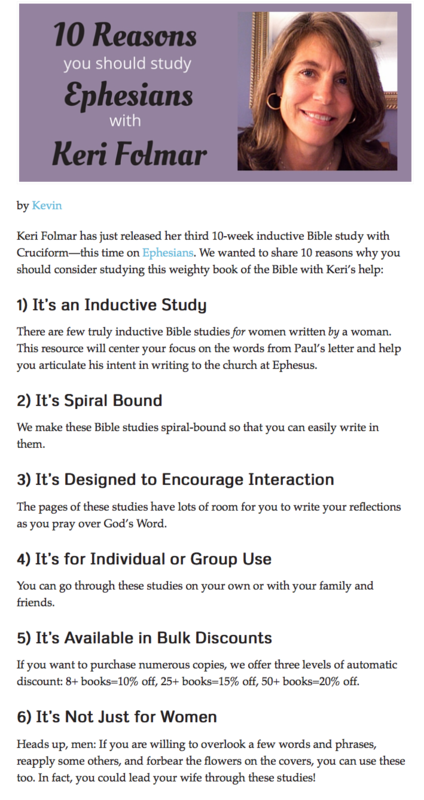 Here is an article Cruciform Press came out with on Keri Folmar after they published (then changed and republished) “10 Reasons You Should Study Ephesians With Keri Folmar. With respect, I think that Ms. Folmar, her husband, her publisher, and anyone else marketing this book needs to re-think the logic of what they’re saying instead of making silly ad hominem attacks in defense of it. And, as we know, the supposed religious beliefs of Ms. Folmar and company preclude men learning anything about the Bible from a woman. Therefore, if they have any integrity, they will omit references to the book being appropriate for men on any level. I’m guessing that this embarrassing lapse in integrity, critical thinking, and judgment occurred because making money is more important to Ms. Folmar and her husband than is adhering to their supposed religious beliefs. Telling 50% of the population (men)that they shouldn’t read your book isn’t a good way to make $$$. Therefore, it was necessary to come up with a specious argument about why the book is appropriate for men. Again, if Ms. Folmar and company truly adhere to their religious beliefs, they should remove all references to this book being appropriate for men. Maybe that’s because there’s no way to let women write scholarly books about the Bible without risking having men learn something from a woman, which is verboten, of course. I don’t know if I want to buy a book from someone who thinks that Tulips have doctrinal indications. That sounds kind of trippy! However, neither the author, the publisher, nor the leadership of the author’s Church had a problem with the idea that men could learn Biblical concepts, from a woman, until they read a blog post calling them onto the carpet about advocating for so-called egalitarianism. If so, it sounds like these folks care a lot more about marketing their books than they care about adhering to the precepts in them. That’s not my only comment on the content of this post yet I want to make sure I have my initial facts straight. Yep, I think you have it about right Janna. Additionally I don’t know how many of the pew-sitters actually think through what is being said and the implications of what is said. There is a lot of what I would consider leadership idolatry taking place. “Touch not the Lord’s anointed” type of thinking. I can’t be too hard on them, I used to be numbered among them. Thanks for bringing my ignorance to light! I will fix it. Hey Buddy!, I found this information for you: "Where Have We Seen This Tactic Before? (Hint: T4G)". Here is the website link: https://thouarttheman.org/2015/09/27/uccd-borrows-a-deceptive-tactic-of-t4g/. Thank you.